Lord Ashcroft’s latest batch of constituency polls looked at four seats in Eastern England that the Conservatives are defending from UKIP. The fieldwork was around 3 weeks ago. The polls found the Tories leading in all of them, by varying amounts. Of the four, North East Cambridgeshire was by far the least competitive, with Stephen Barclay 21 points clear of UKIP. It’s also the only one of the four seats where the Lib Dems polled more than 5% on the second question, and the only one where the Greens are close to deposit-saving territory. While the swing of 13% was interesting, the outcome doesn’t seem likely to be – this remains a safe Tory seat. South Basildon and East Thurrock was perhaps the most interesting contest, that hitherto rare beast that we may start to see more of – a three-way marginal. Both questions showed the Conservatives, UKIP and Labour within 6 or 7 points of one another. The 6-point CON lead should encourage them, but the key thing to watch here is tactical voting. If it remains this close between the three parties, supporters of all three will feel their party is in with a chance, so some very dodgy bar charts will be required for any tactical effect. And since these three parties have over 90% of the vote, with the rest being split multiple ways, there aren’t many votes to squeeze from elsewhere. Boston & Skegness and Castle Point both show slender Conservative leads, although the fact that they show the Tories ahead at all in Boston is notable – probably the most notable finding in this wave of polling. The two constituencies are over 150 miles apart, but show very similar voting intention figures and share a very similar history. And because their electorates have grown more-or-less in line with the national average, boundary changes have been very minor, giving us a long history of comparable elections to look at. This isn’t just of historical interest – it also illustrates two points. First (and fairly obviously) is UKIP’s strength on the East coast. The second is of UKIP’s appeal to voters who have voted Labour in the past, even if they didn’t do so in 2010. Castle Point was captured by Labour in 1997 on a 17% swing, before narrowly being retaken by the Tories in 2001. Boston & Skegness has always been blue, but by only 1.5 points in the Blair landslide elections (though the boundaries were amended in 2010, the overall impact was less than a point). But in both 2005 and 2010, Labour suffered double-digit point losses in both seats. In Castle Point, the Ashcroft poll shows Labour on 16% on the constituency question, a one-point gain on 2010, but still a vote share lower than they polled in 1983 (on the same boundaries as today). 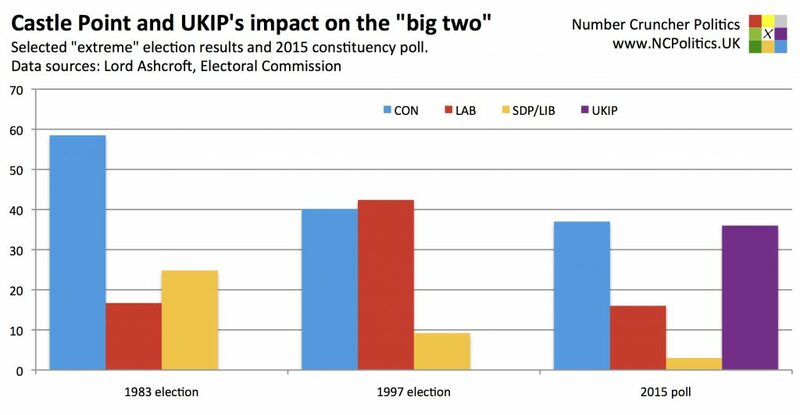 In both seats, the net effect of all of the churn over the last 18 years is a 25% swing from Labour to UKIP. Overall, there are no huge surprises in these polls, but at the margin it’s better news for the Conservatives than for UKIP.